Curiosity drives us to seek out and discover new places, but it's the confidence of finding our way that encourages us to step off the beaten track. 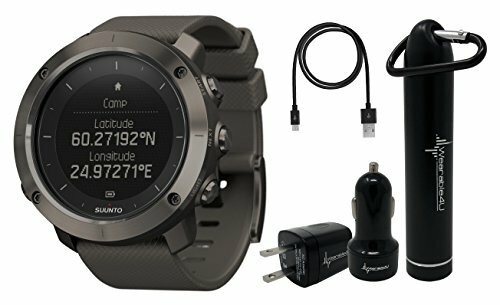 Topographic maps in Suunto Movescount and the integrated GPS and GLONASS navigation of Suunto Traverse help you plan your hikes and find your way in the wild. The automatic breadcrumb of your track ensures you can re-trace your steps when needed. The strong build and powerful battery of Suunto Traverse keep you exploring hour after hour. SUUNTO TRAVERSE: Uses both GPS and GLONASS satellite navigation systems to calculate your speed and location. Altitude, vertical speed and total ascent are measured with FusedAlti, where barometric pressure information is combined with satellite altitude. Suunto Traverse provides up to 100 hours of battery life while recording your outdoor adventures. It is your ideal companion on treks in the wild. Plan your route in Suunto Movescount with topographic maps and stay on course. DISCOVER NEW ROUTES WITH HEATMAPS: Use heatmaps on Suunto Movescount and Suunto Movescount App to find the most popular places to run, ride, swim, ski and more. Heatmaps reveal the tracks frequently used by the Suunto Movescount community all over the globe, based on millions of Moves. Keep your Suunto Traverse charged at all times with our Wearable4U Power Bank and the duo of the Wall & Car USB Charging Adapters!